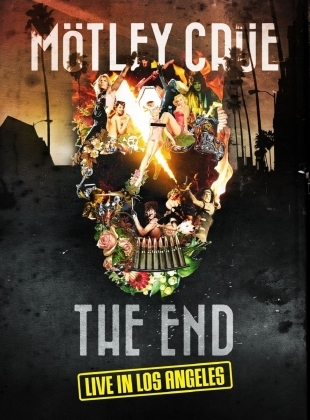 Mötley Crüe: The End - Live in Los Angeles dvd. On 31st December 2015, Motley Crue played their last ever show as a band at the Staples centre in Los Angeles. The band that grew up on Sunset strip and caused riot in the Hyatt had sadly signed a legally binding declaration that they would stop touring as Motley Crue, so this really was the end. However for those who never saw the last ever tour, all is not lost as on the 4th of November 2016 Eagle Rock Entertainment will release this stunning concert on DVD and BluRay. There is also a deluxe edition containing the DVD, BluRay and CD in a 60 page hardback book. What Crue do best is put on a show, and every time I have seen them, this part just gets bigger and better. The most ambitious tour to date was sadly also going to be their last, so Tommy upped his game and had a drum coaster made, you had to be there to witness it. Nikki sixx had a flame throwing bass made, Mick mars doesn’t need any props as he’s cool enough as it is, and Vince just adds a few extra ladies for good measure. Opening up with fans discussing the band, and what to expect from the last ever performance is a nice touch before they hit the stage with “Girls, Girls, Girls,” and “Wild Side,”, the live concert footage is interrupted with interviews with each member of the group before they walked onstage for the last time as Motley Crue. ‘Shout at the devil’ is for me one of the best songs of the night with masses of flame and pyrotechnics all adding to the atmosphere. Tommy Lee’s roller drum coater starts off great, reaching 55 feet at its peak as he spins on a 360 degree horizontal axis. However, once again the coaster became stuck while Tommy was upside down, the same thing happened in Manchester and it took ages for the coaster to kick start up again. Order is restored as Mick Mars show off his guitar playing before leading the band back up to firing on all six again for the superb ‘Saints of Los Angeles’. Vince sings ‘Live wire’ and ‘Dr Feelgood’ like his life depended on it, full of fiery passion, both sounding superb, the crowd are certainly enjoying it. Vince Neil led the crowd in counting down the New Year’s clock as balloons fell from the ceiling and then they ripped into the New Year with “Kickstart My Heart” for the very last time. The stage show throughout the night had been impressive with loads of pyrotechnics and off course Nikki’s bass guitar, yet they still had one or two surprises left as two massive arms extended from the ceiling to the stage so Neil and Sixx had one each which circled the arena allowing the fans a very close up view of these two Sunset strip legends. After 35 years being known as the “World’s Most Notorious Rock Band” it had all come down to this, one special night, with some fans getting very emotional as the enormity of the evening slowly sank it, as this was indeed, The End.